California Metlox Poppytrail soup tureen from their Cabbage line. 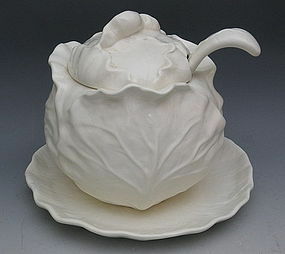 The tureen measures 7" across, ladle 9.5" long, underplate 11" diameter. Assembled with lid and underplate in position, the set measures 10" high. Poppytrail mark is on the underplate. In excellent condition, it dates circa 1970.